Exclamatory Welsh seven-piece Los Campesinos! are following their sold-out November 2011 shows by taking their fourth record, 'Hello Sadness', on the road with a 10-date spring tour. Six years after meeting at university in Cardiff, the indie scene darlings continue to build on their reputation for catchy indie pop and engaging live performances. And not just in the UK. 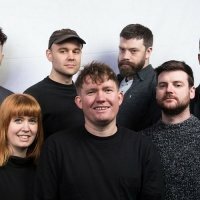 While the music media here talks up Los Campesinos!, it is in the US that 'the peasants' (in Spanish) are doing some of their most impressive work. All four albums released to date have appeared on the US Heatseekers chart (for new or emerging artists), with the last two 'Romance is Boring' and 'Hello Sadness' reaching No 3. 'Hello Sadness' also made both the US indie and rock top 50 charts. Sustained chart success in the UK is proving a little more elusive, with the fourth album making no impression on the album chart. That said, with Britain's beloved Hit Parade now little more than a shop window for grime and R&B artists, making an impact on the weekly countdown is becoming less important. What is key for Los Campesinos! is that they keep interesting the music press, making top-notch indie guitar music and, whatever they do, whatever happens, they must absolutely not drop that exclamation mark. Los Campesinos! kick off their spring tour in Exeter on 20th March, followed by gigs in Bristol, London (Electric Ballroom), Birmingham, Edinburgh and more, before the final date at the Leadmill in Sheffield on 31st March 2012. We have tickets available now, priced £13.50 for the Electric Ballroom gig and £10 for the remaining dates.